Health & Fitness Some people must work out to save their lives. Why are gyms failing them? Some people must work out to save their lives. Why are gyms failing them? Advances in modern medicine have led doctors to a better understanding of the benefits of exercise in managing a broad range of chronic conditions, from multiple sclerosis and cerebral palsy to post-traumatic stress disorder (PTSD) and epilepsy. Unfortunately, traditional gyms aren’t designed with this end use in mind. Sure, there’s bound to be an automatic door opener for people with mobility issues, maybe even a wheelchair lift or a ramp, but that tends to be the extent of the services provided to make fitness accessible to all. Irony of ironies: Where most gyms fail is in serving people with physical disabilities or chronic medical conditions – in other words, people who, in many cases, literally need to work out to save their lives. I work for a not-for-profit facility that prides itself on inclusiveness and diversity. Forgive me if I sound a little too Hands Across America, but I love the fact that my gym – our gym – can serve as a home away from home for everyone, regardless of their race, gender, sexuality or income. But of course, even idealistic wonderlands have their blind spots. A couple months ago I had a conversation with a member of our gym that left me feeling like an ignorant fool. This young woman told me about her medical condition, explained how basic movement is painful and how she often has to rely on mobility assistance devices. Her doctor recommended yoga as a gentle means of managing this condition, but our yoga studio is on the second floor of the building, and the elevator doesn’t allow for direct access. She would have to take the stairs in order to participate, which, given her condition, is not an option. Many physical disabilities are easily identifiable for fitness professionals, as are the solutions to the challenges they pose. Some, however, are harder to identify. Take for example the guest that dropped by our gym with an unmarked service dog trained to detect seizures. 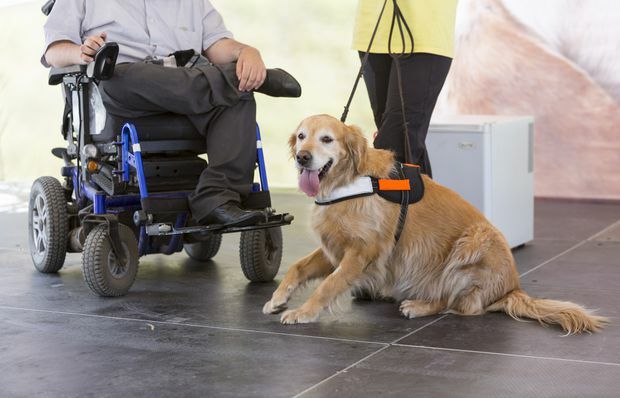 In Ontario, it’s not required for these sorts of service animals to wear identifying harnesses or vests; if a person has a doctor’s note recommending the use of the animal, and that animal is well-behaved, it’s a violation of their rights to deny them access to services and facilities. Of course, when our members saw someone jogging on our indoor track, furry friend in tow, they assumed this dog was simply a pet. Our staff was equally confused. Granted, this sort of thing isn’t a common occurrence, but it does illustrate how ill-informed – and ill-prepared – businesses are when it comes to addressing non-physical disabilities. In Ontario, it’s not required for these sorts of service animals to wear identifying harnesses or vests; if a person has a doctor’s note recommending the use of the animal, and that animal is well-behaved, it’s a violation of their rights to deny them access to services and facilities. Thankfully we have people like Dr. Darren Ezer, co-owner, along with his wife Lianne, of the Live Well Exercise Clinic in Toronto. Live Well is a medicinal fitness franchise that specializes in small group fitness classes for people with chronic diseases, physical disabilities and mental illnesses. With 14 locations across British Columbia and Ontario, Live Well is striving to meet the needs of those who may not feel welcome at commercial gyms by delivering evidence-based exercise programs specific to each individual’s condition in a fun and positive environment. A new Live Well location is scheduled to open in Oakville, Ont., this year. It’s my hope that more fitness pros and gym owners will take after this example and begin offering a broad range of programs and services for everyone, not just the young, jacked and tanned. Otherwise, unifying ideals like diversity and social inclusion lose their power and become nothing more than buzz words for virtue-signalling poseurs. As for my gym, I’m happy to report that steps are being taken to ensure the next noble service animal that pays us a visit will be welcomed with open and understanding arms.